There may be millions of credit cards in circulation across the world these days but the credit card is not a concept that is old as you might think. Believe it or not before the 1950s they simply did not exist – and it really was a cash or check only world. And plastic was not always plastic. The first credit cards looked nothing like their modern counterparts as you will discover. The Very First Credit Card? Legend has it that the very first credit card was created out of a desire by its creator to avoid embarrassment. In 1951 one Frank McNamara was dining out with friends and found at the end of the meal he had neglected to bring his wallet out with him when he left home and was left rather red faced by the whole incident. From this was born what is generally considered to be the world’s very first credit card – The Diners Club Card. By joining McNamara’s Diners Club members could pay their restaurant bills off monthly and only have to present their Diners Club card when dining out. The card was made from flimsy paper and looked a lot like a library card but it did spark the whole credit card revolution. The first almost plastic credit card was also the first credit card offered by a bank in the US. The Bank of America created the Bank Americard, which allowed customers to spend up to a predefined limit and then pay the balance off at the end of the month or carry some of it over for an interest fee. The card was very thin plastic, embossed with a name, credit card number and expiration date. Design wise it was an off white with a rather ugly khaki and blue logo but it was the first credit card to resemble todays. Back then though, in 1958, credit ratings meant nothing and the first 60,000 Bank Americards were issued unsolicited and at random to residents of Fresno, California. Just a year later in 1959 the very first American Express card appeared in the US. The original logo on the card, which vaguely resembles the one used today instantly caused a bit of controversy. 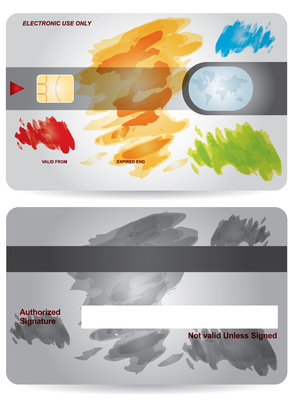 This warrior on this new charge card – was it supposed to be a Viking or a Gladiator? Or a Roman Centurion? Or a fantasy mix up of them all? Debate raged for some time but actually the fact that a quick look at the description of the trademark that the American Express company took out tells you it is a “gladiator on a shield”. And actually when you look at that original logo now how anyone ever thought it was a Viking is hard to understand. Viking/Gladiator controversy aside that first American Express card was a much sturdier plastic card but it was not green Instead it featured purple lettering and a purple logo on a white background. It was also American Express who introduced that great status symbol, the gold card. Described in commercials in 1968 as an “executive” charge card this first gold card was crafted from a thicker plastic than ever used before, was completely gold in color with black lettering and quickly became the status symbol for the successful businessman (and occasional business woman) in the late Sixties and early Seventies. Although when it debuted back in 1970 the first MasterCard was actually called a Master Charge the one thing that was exactly the same then as it is today is the company logo. Those interlocking circles are exactly the same in 21st century MasterCards as they were on those first Master Charges. A case really of if its not broken, don’t fix it as that has to be one of the most recognizable logos in the world, together perhaps with McDonald’s Golden Arches. The Visa logo has not changed too much since Chase Manhattan Bank offered the first VISA card in 1984 either. By the time VISA joined the fray America had already gone credit card crazy – 71% of those aged between 17 and 65 had at least one credit card in their wallet and the average debt carried on them in 1984 was $1,492, up from around $600 in 1970. The black and orange Discover card was introduced in a commercial during the Super Bowl in 1986.Its bold look was as intriguing to consumers at that early tag line was. That first ad proclaimed “Very few things cost you nothing to get and pay you back every day. But the new Discover Card does.” The Discover card was indeed the card that introduced the now very common concept of cash back rewards. By the late 80s advertisers and banks realized that a credit card could actually also be a great advertisement for companies of all kinds and began pitching the idea of a co branded credit card. The first were issued in 1989 by MasterCard through CitiBank and featured the helmets on logos of NFL teams and football fans snapped them up instantly. The Rolling Stones were persuaded to take the concept even further in 1995. A MasterCard debuted that not only featured that famous lips logo but also offered special discounts on Rolling Stones merchandise and tickets according to the level of usage. Controversially by 1997 even colleges had got into the co branding game, with banks offering student credit cards that featured the images of a students college or alma mater. The move was controversial because it was very easy for students to get these credit cards and all too easy for them to run up a lot of debt that Mom and Dad were going to have to bail them out of and the fact that the colleges seemed to be encouraging credit card use made a lot of parents very angry indeed. First offered by Capital One in the late nineties personalized credit cards have become hugely popular. These cards let you upload your own images form your personal photo collection and have them printed on your credit card. So now, if you want everyone to see the pictures of your baby every time you use your credit card you can but a recent survey found that more people uploaded pictures of their cats to be used on their personalized credit card than any other image, with dogs coming a close second!